Secret Santa is something I love the idea of but then when it actually comes down to making the purchase panic sets in quickly. It feels like the biggest challenge in the world to get a decent gift with a usually small budget for someone you potentially don't know very well. TQR are coming to the rescue and giving you some unique ideas for every type of girl. I think when the budget is low one of the nicest things you can get somebody clothing wise is pyjamas, slippers, hats and gloves. For pretty, budget buys Primark is your best friend. They do lovely, decent quality comfy and cosy items in loads of different styles that anybody would love. For hats and gloves Asos is your go to, great really on trend stuff at a fab price. This obviously depends on who you have for Secret Santa but a lovely ornament xmas themed or otherwise is a lovely gift. 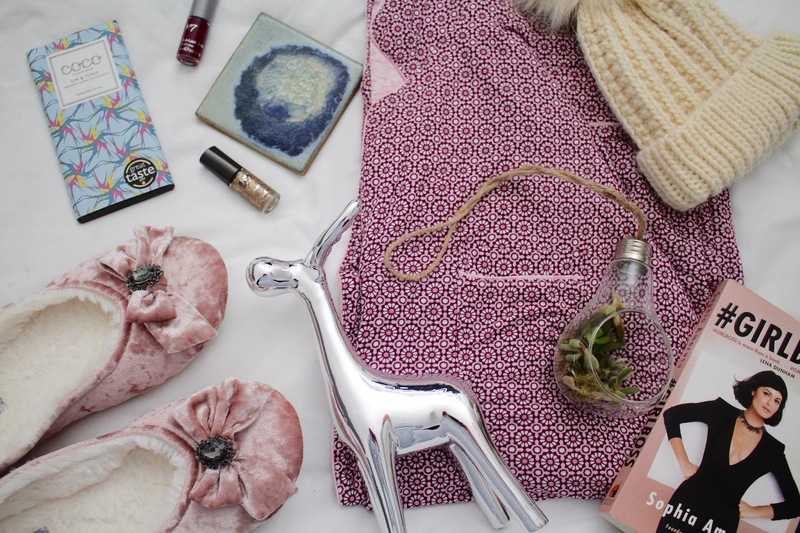 The little reindeer is from Primark, and the lovely celestial coaster was just £8.00 from the beautiful Anthropologie. I got the cute little lightbulb succulent in a lovely Christmas stall in Edinburgh. I think you could easily find or make something similar in and about your local town. I love all things beauty and I think a lovely piece of make-up or skincare is such a coveted gift of many women. Boots or Superdrug are your best bets for a budget beauty buy. Loreal, Soap n Glory and No7 are the best of the bunch for gifts in my opinion. A lovely nail polish or eyeshadow is easy to pick out and will please many a beauty obsessed recipient. Chocolate is something a lot of people love and I think a lovely luxury bar of the stuff makes a great gift for something. Edinburgh based company Coco Chocolatier does a variety of amazing flavours that are around £5 each and are packaged so beautifully it would make a gorgeous gift for anybody. You can get a million different types of books for every person and every interest. Whether it is a coffee table book or a cook book its the sort of thing that will be well received. A great idea is to buy someone one of the books from the 100 Books you should read before you die list. Okay so last but not least I wanted to give you a list of amazing tat to gift a male secret santa, someone you don't know very well or just the most difficult person in the world. Your first stop should be Not on the highstreet it is a great website especially for gifts and you can personalise everything and get someone something really unique. My go to gift for secret santa for anyone with a sense of humour is a £10 deck of Cards Against Humanity, filthy but completely hilarious for parties and get togethers.